I am trying to install the blender add-on, MACHIN3tools but I’m getting an error message. https://i.imgur.com/Ozook18.jpg …I’ using Blender2.8 and the latest version of the add-on v0.3.10 . and I’m using the Ïnstall from file in preferences selecting the downloaded ZIP file " any help much appreciated. Might be a better idea to ask the author himself. 0f5b53ba4dc is from December 1st 2018. Update Blender. Thanks MACHIN3 for the quick reply. 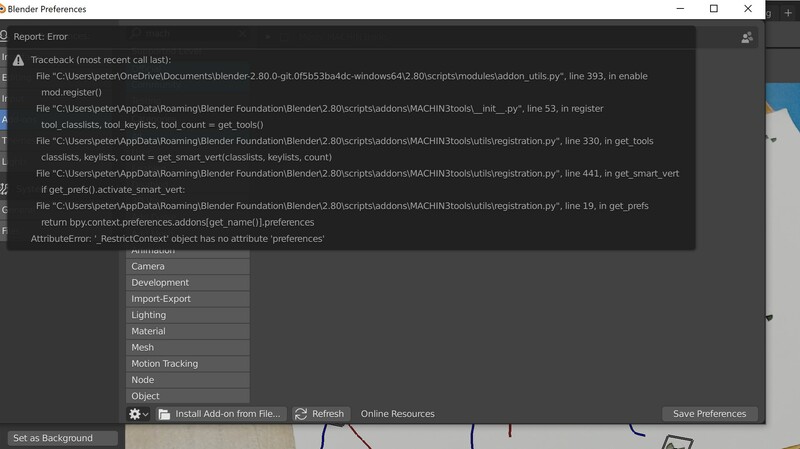 I downloaded latest version of Blender 2.8 but still can’t seem to get MACHINtools3 add-on installed. ??? …not sure what I’m doing wrong ?? problem solved , close down and restart was needed .